Ocala isn’t just a place; it’s a way of life. No local publication embodies this better than Marion County’s premiere community magazine, Ocala Style, and no local brokerage believes this more strongly than Showcase. 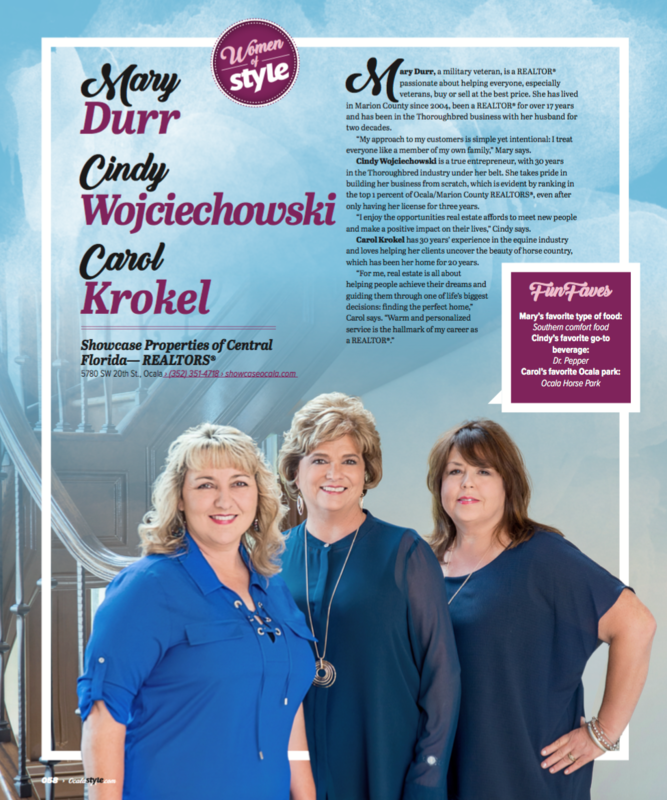 Last month, we teamed up with Ocala Style for their Women and Men of Style features in order to highlight some of our most driven and community-focused agents. Here are the agents we were honored to have featured, and who we’re proud to have on our team. 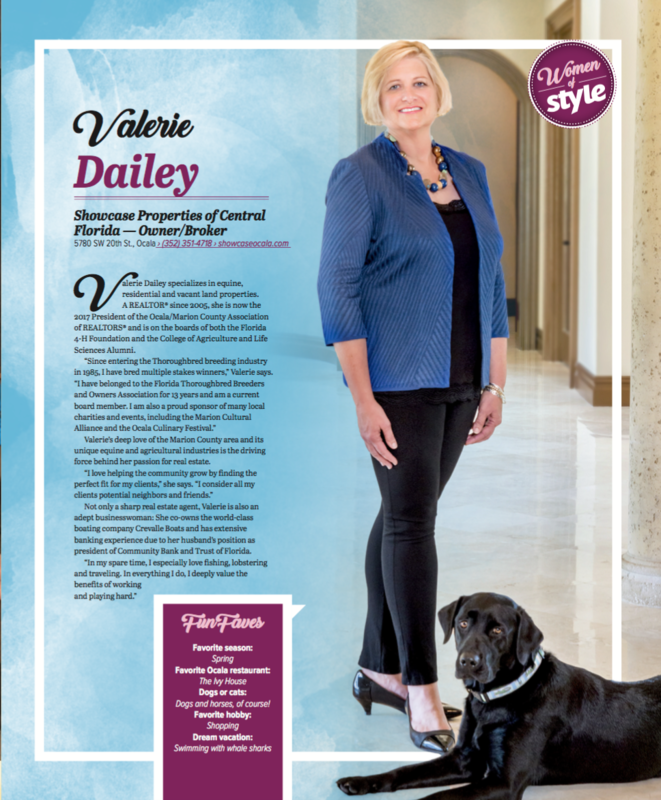 Valerie Dailey is the owner/broker of Showcase Properties, and specializes in equine, residential, and vacant land properties. She has been a realtor since 2005, is the 2017 President of the Ocala/Marion County Association of Realtors, and is on the boards of both the Florida 4-H Foundation and the College of Agriculture and Life Sciences Alumni. Since entering the thoroughbred breeding industry in 1985, she has bred multiple stakes winners, including a Breeder’s Cup qualifier. Valerie has belonged to the Florida Thoroughbred Breeders and Owners Association for 13 years, and is a current board member. She is also a proud sponsor of many local charities and events, including the Marion Cultural Alliance and the Ocala Culinary Festival. Valerie’s deep love of the Marion County area and its unique equine and agricultural industries is the driving force behind her passion for real estate. She loves helping the community grow by finding the perfect fit for her clients, and considers all of her clients potential neighbors and friends. For her, even the inherent challenges of real estate are part of the industry’s charm: whether navigating the market for people seeking their first home, or helping homeowners sell their homes and move on to the next chapter in their lives, Valerie remains undaunted. Not only a sharp real estate agent, she is also an adept businesswoman: Valerie co-owns the world-class boating company Crevalle, and has extensive banking experience owing to her husband’s position as President of Community Bank. In her spare time (when she has spare time), Valerie spends as long as she can outdoors, enjoying Central Florida’s natural beauty. She especially loves fishing and lobstering, and travelling when she can. In everything she does, Valerie deeply values the benefits of working hard and playing hard. Mary O’Neal has been involved in the Ocala equine industry for 18 years and has been a realtor for nearly 15 years. Her passion for real estate lies in meeting the challenge of finding her clients the perfect place to call home. Mary embraces the active life: she has been active in the Quarter Horse and Thoroughbred industries, and has studied ballet in Boston and New York City. Today she enjoys sponsoring and participating in charity cycling events. Jody Micilcavage fell in love with Ocala when she moved from upstate New York in 1996; she helped found Showcase Properties in 2000 and specializes in golf course and country club properties. Her real estate business ethos is to never be satisfied until her customers are. She has served her community in many ways, including on the board of The Ocala Royal Dames for Cancer Research. Kathy Prater is a real estate industry pro with over 30 years of experience, and believes that honesty and integrity, with a touch of humor, can go a long way in turning a valued client into a friend. In addition to helping her clients discover Ocala, she has served her community as the President of the Florida Thoroughbred Fillies. Mary Durr, a military veteran, is a realtor passionate about helping fellow veterans find a great place to live. She has lived in Marion County since 2004, been a realtor for over 17 years, and has been in the thoroughbred business with her husband for two decades. Her approach to her clients is simple yet intentional: she treats every single one like a member of her own family. Cindy Wojciechowski is a true entrepreneur, with 30 years in the thoroughbred industry under her belt. She takes pride in building a business from scratch, a drive she brought to bear when becoming a realtor three years ago. She enjoys the opportunities real estate affords to meet new people and to make a positive impact on their lives, and loves the natural openness of the Ocala landscape. Carol Krokel has 30 years’ experience in the equine industry and loves helping her clients uncover the beauty of horse country, which has been her home for 20 years. For her, real estate is all about helping people achieve their dreams, and guiding them through one of life’s biggest decisions: finding the perfect home. Warm and personalized service is the hallmark of her career as a realtor. David Williams has 35 years of experience in the real estate industry, 27 of those in Marion County. Not only is he a licensed Florida Real Estate Broker Associate, but is also a mortgage, property, and casualty insurance broker. A former buyer, trainer, and seller of Quarter Horses, Williams uses his pervasive knowledge of the Marion County and equine markets to specialize in farm, land, and commercial properties. 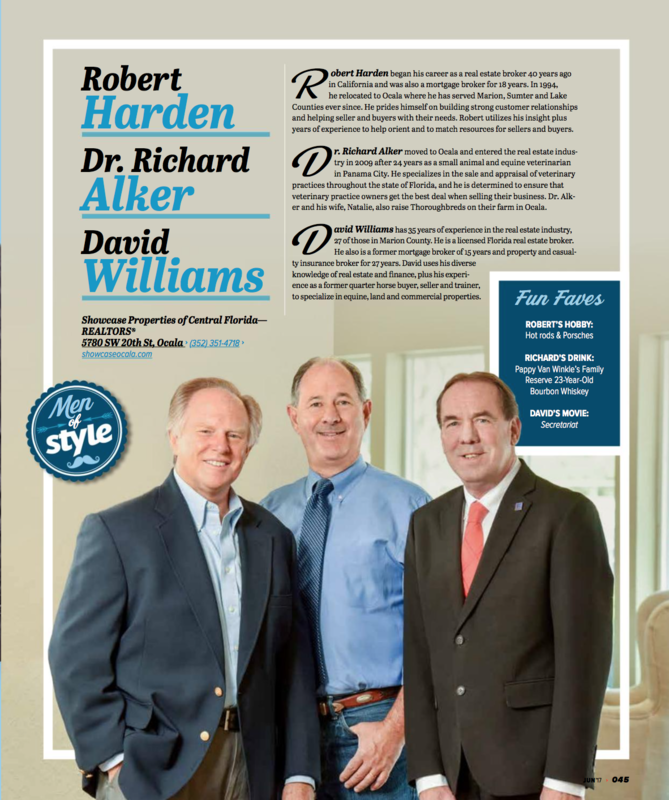 Dr. Richard Alker moved to Ocala and entered the real estate industry in 2009 after 24 years as a small animal and equine veterinarian in Panama City. He specializes in the sale and appraisal of veterinary practices throughout the state of Florida, and is determined to ensure that veterinary practice owners get the best deal when selling their business. Dr. Alker and his wife Natalie also raise Thoroughbreds on their farm in Ocala. Robert Harden began his career as a broker 40 years ago in California and relocated to Ocala in 1994 where he has served Marion, Sumter, and Lake Counties ever since. He prides himself on building strong customer relationships and helping out-of-state buyers discover Ocala. Harden utilizes his insight as a transplant to help orient and secure local resources for others seeking relocation in the area. 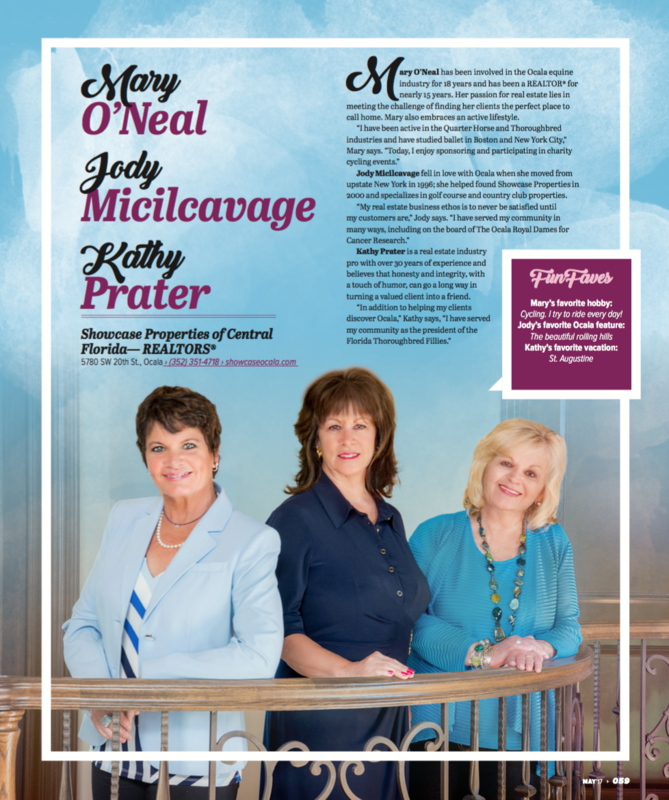 For the full spread, check out Ocala Style’s website where you can find both the Women’s and Men’s features, which include several other professionals of note throughout the Marion County area. Give ’em a look!